We have outgrown our current location and are moving our native plant nursery. Our new facility will be operational in April, 2016. The new nursery will be located on Chambers road just past the school. Currently we grow about 50,000 native grasses, shrubs, and trees. With our new facilities we will be able to grow up to 200,000 native plants. Our new facility will have two greenhouses, an expanded parking area, a shade structure, outdoor work space, and an expanded native plant demonstration garden. We have broken ground on our new site! We still have a lot of work ahead of us and there are a variety of different ways you can become involved and help us make this transition. There are several upcoming events in which you can help. March 25th AND 27th The Great Nursery Migration Volunteer Events! We will meet at the Mattole Valley Community Center at noon on Friday, 3/25 and at 10am on Sunday, 3/27. 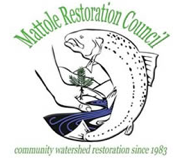 Come be a part of a big change at the Mattole Restoration Council. Click here for more details. July 9th Hoop House Hoedown! We will have a barbecue, music, dancing, and more. There is also a raffle with the opportunity to win great prizes. Click here for more details. We are trying to raise $40,000 for nursery move and upgrades. We need your help. Thanks to The Nature Conservancy for this great piece on the Mattole Estuary Project! 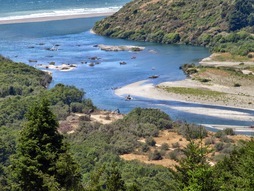 Restoring the Mattole River Estuary – Defense for the Drought? Last winter’s drought impacted many things, including the coho, Chinook salmon, and steelhead that live in the Mattole River. A significant portion of the returning adult coho and Chinook this past fall and winter were limited to the lower Mattole River downstream of Honeydew due to low flows. The result? Fish spawned where they could in the lower river, rather than heading further upstream where the normally go and where stream habitat is better for growing fish. So what can we do about this situation? What will the young fish do? We accelerate our efforts to restore the habitat they can reach – by returning the Mattole estuary back to a healthy estuary/lagoon with deep pools and extensive riparian and slough habitat. There is a complex of elevated slough channels along the south bank of the Mattole River estuary that were disconnected from the river after the 1992 Triple Junction earthquakes uplifted the area by 3-5 feet, and subsequent deposition from over-bank flows filled in the old river channels. This slough restoration project excavated 250 feet of one of these historic channels to create off-channel habitat for juvenile salmonids in the summer of 2014. This slack-water habitat will have cooler water temperatures than the main river and an abundance of insects (food for juvenile salmonids) from the extensive over-hanging riparian vegetation. It will serve as a refuge from high water velocities in the winter and be a veritable paradise of cool water temperatures and abundant food in the summer. The work dredging the old, filled-in and uplifted slough channel was finished in early July. We have also completed extensive terrace margin treatments with willows, whole trees, wooden posts and logs, and thousands of willow cuttings. The willow and wood trenches are designed to lengthen the life of the slough excavation area by providing hardness (vegetation and logs) upstream. When the terrace gets inundated with water, the willow will also help to settle fine sediment upstream of the slough channel. Two hundred Douglas fir trees were helicoptered into the estuary to accelerate the rebuilding of fish habitat. In summer, fish can rest in these deeper, cooler pools created by these log structures (see close-up on left) when flows are low, and in winter, shelter from the high flows. Flying in the logs took only 11 hours! This restoration project was fast and actually cheaper than trucking them in. Now we wait for the fish to grow fat and healthy in their new homes. In 2012, the Bureau of Land Management (BLM), working with local landowners, watershed groups, and numerous other state and federal agencies, developed a 5-Year Restoration Plan for the estuary/lower river on BLM lands. The slough project partners are the Mattole Salmon Group and the Mattole Restoration Council who are completing all of the associated willow planting work, and Patrick Queen, a local heavy equipment operator and problem solver. Funding comes from the California Department of Fish and Wildlife, The Nature Conservancy, the National Fish and Wildlife Foundation, and the National Oceanic Atmospheric Administration, with funding and staff support from the Bureau of Land Management, and tree donations from Ellen Taylor and Michael Evenson. The helicopter wood project was led by the Mattole Salmon Group, with funding and technical support from the National Oceanic Atmospheric Administration, The Nature Conservancy, and the California Department of Fish and Wildlife. Read more about the slough project and helicoptor wood project. From managing recreational activities to conserving natural and cultural resources to facilitating energy development, the responsibilities of the Bureau of Land Management in California are diverse and challenging. A team of hard working partners recently planted thousands of grass plants on a coastal prairie overlooking the Pacific Ocean in Northern California, contributing to an ongoing effort to restore 850 acres of grassland that has been impacted by encroaching shrubs and Douglas-fir trees. 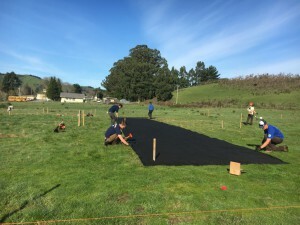 Staff from the local Mattole Restoration Council worked with the Americorps Watershed Stewardship Project, applying eight species of grass seed and planting 30,000 plugs of six grass species over 18 acres of BLM-managed public land on Prosper Ridge near the community of Petrolia. Neighborhood volunteers and community contractors had previously cleared shrubs and young trees from the restoration site. Through this effort, BLM is enhancing the proportion of deep-rooted, native perennial grasses compared to non-native, annual and perennial grass species of lesser value. Native plants were locally developed and annually propagated as part of the BLM Arcata Field Office’s participation with the BLM Seeds of Success program. BLM botanist Jennifer Wheeler has been directing the program and attributes success to a cooperative partnership with the Mattole Restoration Council, a local non-profit group focusing on various aspects of watershed restoration in the Mattole watershed and adjacent areas in the King Range National Conservation Area. There are several phases in the restoration project. The project began with mechanical removal of coyote brush and young Douglas-fir trees in predefined units to build buffer areas to meet community safety expectations and reduce fuel loads. After several years of treatment, the BLM will use prescribed fire, timing the broadcast burns to maintain the area as a productive grassland. Throughout the woody vegetation removal process, disturbed soil areas will be sown with native seed and clovers, and/or planted with native bunchgrass plugs to establish new colonies capable of their own reproduction and expansion.